When we put the full picture together, it becomes clear that charter schools and the students they serve are doing more with less. 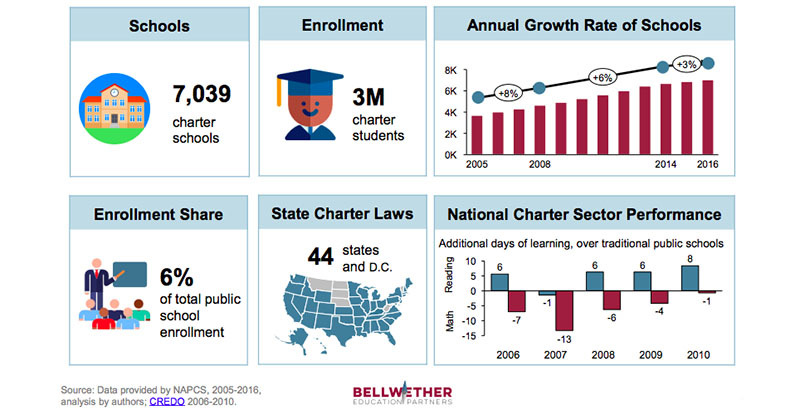 How much more success might charter school students experience if their schools were equally funded? Might more students of color graduate from college? Might more low-income students help end the cycle of poverty for their families? To adequately address these gaps, policymakers should take steps to make funding fair. Gaps stem from a variety of sources, including state per-pupil operational funds, categorical grants intended for specific educational programs and local revenue. Policymakers should first identify the policies and practices that drive funding gaps in their locale and then develop solutions specific to their city or state. Colorado and Utah, for example, allocate equivalent operational funding to charter and district schools, and charter schools can access the same categorical funds as district schools. A common critique of charter schools is that they drain resources from public schools, but these data tell a different story. The truth is that at every level of government — federal, state and local — charter schools receive less funding that traditional public schools. As a result, they make strategic concessions to extend the reach of their limited budgets, including operating in lower-quality facilities such as smaller spaces without a gym or a full kitchen, or offering fewer student supports. For far too many students, and for students of color especially, charter schools are their only chance to get a great education. That chance is put at risk when charter schools have to shutter their doors or limit their seats because of inadequate funding. Brandon Lewis is an analyst at Bellwether Education Partners. Previously, he was an education policy manager with the National Urban League, where he worked to shape the league’s educational equity agenda and analysis of the Every Student Succeeds Act. Disclosure: Bellwether Education Partners was co-founded by Andrew Rotherham, who sits on The 74’s board of directors.